By any other Name it is Good Old Fashioned Sculpture. The term Dimensionalization should leave the lexicon of stereo conversion. First off, it is a buzz-word that Madison Avenue could have invented that says very little about the process, and it also calls forth images of an automated process that is simple to do. Secondly, it is a copyrighted phrase for a now defunct company, but mostly it is an inaccurate description. As an example, think of this sentence: “I have converted a 3D world into 2D with the use of a camera lens. It is now dimensionalized”. The word does not properly define anything, other than we have shifted dimensions. What we in the stereo conversion community do is called Depth Sculpture. It is not a copyrighted term, and is an accurate description of the process. The artists are literally sculpting a form with 3D models or depth gradients to build a 3-dimensional image in front of the viewer’s eyes. If done with paper, or clay it would be called thus, so why not this? I coined that particular term in the wake of the beginning of “Dimensionalization.” I have been doing stereo conversion longer than the industry generally existed, and when the term lifted its head, I thought it clever — though inaccurate. When I heard they copyrighted a word from the English language I was shocked, and thought of Depth Sculpture as a more apt description. 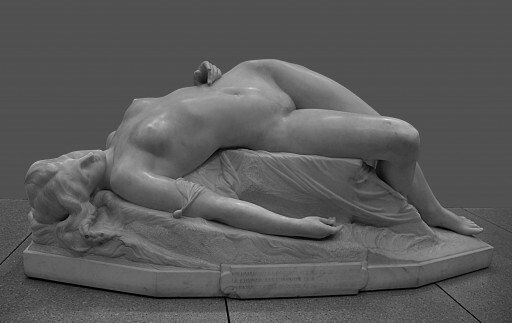 I stumbled across the purpose of depth sculpture in the birthplace of Visual Effects —Paris, France— during a visit to the Musée d’Orsay. Although full of thousands of inspiring paintings and drawings, it was the sculptures that grabbed my attention. The forms were beautiful, and engaging, and I could not take my eyes off of them. There are magnificent works of art carved in Marble at every turn in the sculpture garden. Marble has a quality we call sub-surface scattering, but until you witness it in three dimensions as your eyes fall into the surface, and fully appreciate the material it is made of in depth, you only know half of the experience. A hyper-stereo Anaglyph capture of Auguste Clésinger’s Woman Bitten by a Snake. The stereo view allows us a greater appreciation of the form, which is exactly what we want from a stereo 3D picture of a famous actor. Note how the hyper-stero miniaturizes this image of a sculpture that is 70 inches across. Charles Cordier’s work, photo taken during that first visit at the Paris Museum. 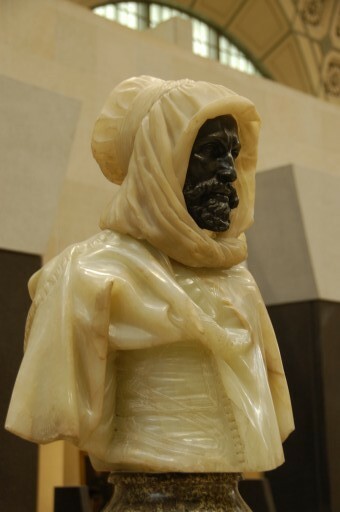 His work is a prime example of depth in material, as the observer’s eyes are figuratively sucked into the “cloth” made of translucent marble. I used this correlation to inspire our artists working on Immortals in 2011. I pointed out that we do not go to a 3D movie to have things thrown at our face, we go to get close to the subject. We want to feel like we could smell the dinosaur’s breath, or appreciate the form of a famous actor’s face — as if we met them — and feel the texture of heavy burlap costumes, or chain mail. When we talk about 3D movies, we keep using the terms “feel” and “touch.” It is inherent 3D language, and we use it intuitively. Therefore during stereo conversion we need to accurately represent the forms as if they were a texture of the scene, and work the depth to create a nearly visceral experience. It remains one of the guiding concepts of stereo design. Phil Tippett spoke once about this engagement with real objects at the Visual Effects Society at one of the award shows, where he was honored. He lamented the loss of doing anything “real.” He talked of the feel of clay in your hands, and that sculpting a creature is a dialogue between you and the material you are working with. You push, it pushes back. Stereo filmmaking can provide a similar experience, but we push and pull with our eyes. Good Depth Sculpture provides movement within a still frame, as our eyes move across the surface. It is up to the artist to deliver that experience, and push back against the inherent 2D nature of the image. I once had opportunity to show the results of this to Phil, and I hope it opened his eyes a bit. 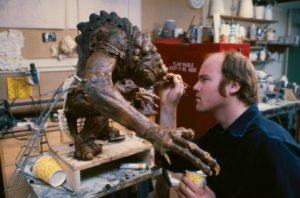 The enormously talented Phil Tippett working with his hands. Recently there is an up-tick of the word “sculpture” appearing in articles about stereo converted films. Having worked with several conversion facilities, and trained many of the original conversion artists over the years, I hope we as a group are killing the term “Dimensionalization.” There are thousands of artists worldwide who pour a significant amount of work into a stereo converted film, and if they do their job right you will never notice. This is not some gimmicky slogan. It is Art. Choose your words wisely, and give worth to your creation.